It was an honour to be invited to participate in a recent gathering for the Tribal Parks movement. 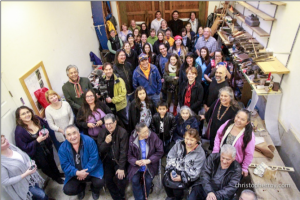 This was hosted by the inspiring peoples of Tla-o-qui-aht Nation in the Clayoquot Sound UNESCO Biosphere Reserve on the west coast of Vancouver Island, British Columbia. Assembled were many First Nations elders, leaders, cultural teachers and community organizers. These powerful change-makers journeyed from as far north as the mighty Peace River region of Treaty 8 through to the central north coast of California, and central Canada. All have contributed to or are engaged within a growing movement reclaiming Indigenous rights and responsibilities for traditional land stewardship. “Hishuk ish ts’awalk”, Everything Is One. The Tla-o-qui-aht Tribal Park territories are world-renowned for their beauty, dramatic scenery, and abundance. So it was profoundly comforting to be enveloped by these lands and their local champions, as we attended sessions, shared heart-warming stories, feasted, discussed our challenges and lessons learned, and talked about what we might do better together as we protect and safeguard our lands and territories. Tribal Parks’ closely links to the Indigenous Peoples’ and Local Community Conserved Areas and Territories (ICCAs). These are defined as “natural and/or modified ecosystems containing significant biodiversity values and ecological services, voluntarily conserved by (sedentary and mobile) Indigenous and local communities, through customary laws or other effective means.” According to information and reports referenced via the ICCA Consortium, the past decade has seen impressive progress in the application of community-based coastal resource management within the South Pacific, to take this region as an example. According to one inventory, there are 558 locally managed marine areas and 564 community conserved areas (Govan et al. 2009) within eight sampled countries in Melanesia and Polynesia. However, the data are considered highly inaccurate as to the actual instances of what is also known as “customary tenure”; there is a potential for community resource management over the bulk of Pacific Island land and coastal waters. Traditional knowledge and resource ownership, combined with a local awareness of the need for immediate action, are frequently the starting points for these community- driven initiatives. While the challenges may be a bit different in the north and the south, there are some hazards, processes and tactics that offer deep lessons to all. As shared by Loretta, “The fight against Fish Lake [a mining operation] made the people dig in and reclaim their cultural strengths, they brought back our songs”. Others spoke about how “a disconnected worldview is a dangerous one”, and of the importance of recognizing each other, of learning from our shared struggles, and of friendship, support and solidarity. Recognition of each other’s histories and efforts to decolonize was a common thread throughout the meetings, so it was a hopeful note in which our sessions began to close. Together, we witnessed an act of reconciliation (or Reconcil-in-ACTION, as Tofino Mayor Josie Osborne expressed it!). On the last day of events, we were brought to the town centre in Tofino, to a special property called Monks Point (Mariner Captain Monks home). This historic property was originally known as načiqs (Nachaks) “look out over the ocean” by the Tla-o-qui-aht peoples, and is strategically located upon a steep rock outcrop just above the cove’s entry point, providing expansive views of the harbour and Clayoquot Sound. Since time immemorial, the Tla-o-qui-aht people used the spot to view the comings and goings in their territory. 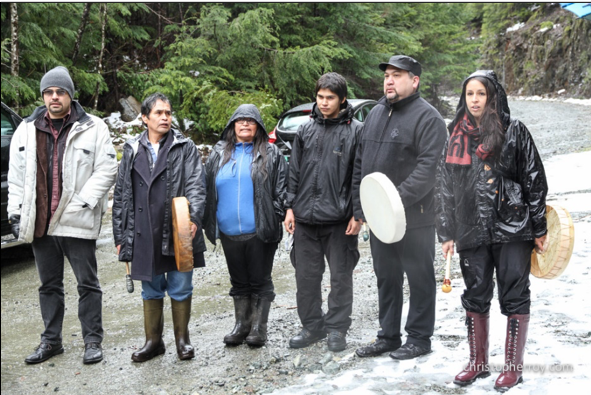 That day, it was declared that a process was underway in which the stewardship of this historic and significant property would be shared with the Tla-o-qui-aht Nation as part of their “government to government” reconciliation process. After witnessing the passion of fellow attendees and their life-changing actions, for me the rich experience was summed up by Joe Martin, Tla-o-qui-aht Master Canoe Maker, Historian, Cultural Educator and successful Activist. “Like these lands at načiqs, perhaps we could look out for each other.” Thus we departed refreshed, cleansed by the rain, uplifted by expanded possibility, and resolute in solidarity. Thank you to the organizers, sponsors and contributors to this important gathering. More photos by Christopher Roy can be found here here.